Este artigo analisa a relação entre as ideias teóricas de Michael Balint sobre saúde e doença, sua prática de trabalho em grupo com médicos (“grupos Balint”) e algumas ideias epistemológicas menos conhecidas da Escola de Psicanálise de Budapeste – lar psicanalítico de Balint. Embora Balint tenha começado a explorar o trabalho com grupos nos anos 1920 e 1930 em Budapeste, seu método amadureceu depois de seu exílio na Inglaterra, nos anos 1950. Este artigo baseia-se na rica correspondência de Balint encontrada nos arquivos da Sociedade Britânica de Psicanálise, e em documentos que apreendem a construção dos “grupos Balint”. O objetivo aqui é recuperar a radicalidade de Balint em seu trabalho com médicos, assim como propor uma genealogia desta radicalidade. Em primeira instância, reconstruímos o clima cultural e político de Budapeste nos anos 1920 e 1930. Em um segundo momento, nos concentramos nas ideias de Sándor Ferenczi sobre epistemologia e sobre a relação entre psicanálise e medicina. Em seguida, discutimos o lugar da contratransferência na Escola de Psicanálise de Budapeste. Finalmente, abordamos as particularidades do encontro entre psicanálise e medicina tal como se deu na Inglaterra, nos anos 1950. Wellcome Trust Fellow in Medical Humanities, Department of Psychosocial Studies, Birkbeck College/University of London. Membro efetivo do Círculo Psicanalítico do Rio de Janeiro (CPRJ). BALINT, Michael. Psychoanalyse und klinische Medizin. Z. Klin. Med, n. 103, 1926. ______. (1930). Te crisis of medical practice. Te American Journal of Psychoanalysis, ano 62, n. 1, p. 7-15, 2002. ______. On the psycho-analytic training system. Te International Journal of Psycho-Analysis, ano 29, p. 163-173, 1948. ______. Primary Love and Psycho-analytic Technique. London: Tavistock, 1953. ______. Analytic training and training analysis. Te International Journal of Psychoanalysis, ano 35, n. 2, p. 157-162, 1954. ______. (1957). Te Doctor, His Patient and the Illness. London: Pitman Medical, 1964. ______. Te Basic Fault. London: Tavistock Publications, 1968. ______. La genèse de mes idées. Gazette médicale de France, ano 77, 1970. DUPONT, Judith. Excerpts of the Correspondence of Michael and Alice Balint with Olga, Ladislas, and Judith Dormandi. Te American Journal of Psychoanalysis, ano 62, n. 4, p. 359-381, 2002. ERŐS, Ferenc. Psychoanalysis and the Emigration of Central and Eastern European Intellectuals. Te American Journal of Psychoanalysis, ano 76, n. 4, p. 399-413, 2016. ERŐS, Ferenc; KAPÁS, I.; KISS, G. Giampieri, P. S. Sándor Ferenczi and the Budapest University 1918-1919. Documents of the History of a University Department. Pszichológia, ano 7, p. 584-92, 1987. FERENCZI, Sándor (1900). Conscience et développement. In: Les Écrits des Budapest. (G. Kurcz & C. Lorin, Trans.). Paris: E.P.E.L, p. 63–70, 1994. ______. (1912). Philosophy and Psychoanalysis. In: Final contributions to the problems and methods of psychoanalysis. (E. Mosbacher, Trans.). London: Karnac Books, p. 326–334, 1994. ______. (1921). Te symbolism of the bridge. In: Further contributions to the theory and technique of psychoanalysis. (J. I. Suttie, Trans.). London: Karnac Books, p. 352–356, 1994. ______. (1922). Freud’s “Group psychology and the analysis of the ego”. In: Final contributions to the problems and methods of psychoanalysis. (E. Mosbacher, Trans.). London: Karnac Books, p. 371–376, 1994. ______. (1924). Talassa: a theory of genitality. (H.A. Bunker, Trans.). New York: Psychoanalytic Quarterly, 1938. ______. (1926). Te problem of acceptance of unpleasant ideas–Advances in knowledge of the sense of reality. In: Further contributions to the theory and technique of psychoanalysis. (J. I. Suttie, Trans.). London: Karnac Books, p. 366–379, 1994. ______. (1933). Freud’s inﬂuence on medicine. In: Final contributions to the problems and methods of psychoanalysis. (E. Mosbacher, Trans.). London: Karnac Books, p. 143–155, 1994. FERENCZI, Sándor; RANK, Otto. Te development of psychoanalysis. (C. Newton, Trans.). New York: Nervous and Mental Disease Publishing Company, 1924/1925. FOUCAULT, M. (1975). Vigiar e punir: história da violência nas prisões. Petrópolis: Vozes, 2006. HIDAS, György. Ferenczi and trauma: A perilous journey to the labyrinth. In: SZEKACS, J.; KEVE T. (Org.). Ferenczi and His World. London: Karnac, p. 111-128, 2012. JAHODA, Marie. Te migration of psychoanalysis. In: FLEMING D.; BAILYN B. (Org.) Te Intellectual Migration: Europe and America, 1930–1960. Cambridge, MA: Te Belknap Press of Harvard University Press, p. 425-445, 1969. KOVÁCS, Vilma. Training and control analysis. Te International Journal of PsychoAnalysis, ano 17, p. 346-354, 1936. MÁRAI, Sándor (1939). O legado da Eszter. São Paulo: Companhia das Letras, 2001. MÉSZÁROS, Judit. Sándor Ferenczi and the Budapest school of psychoanalysis. Psychoanalytic Perspectives, ano 7, a. 1, p. 69-89, 2010. ______. Ferenczi and beyond: exile of the Budapest school and solidarity in the psychoanalytic movement during the Nazi years. London: Karnac Books, 2014. OSBORNE, Tomas. Mobilizing psychoanalysis: Michael Balint and the general practitioners. Social Studies of Science, ano 23, n. 1, p. 175-200, 1993. STANTON, Martin. Sándor Ferenczi: reconsidering active intervention. London: Free Association Books, 1990. SWERDLOFF, Bluma. An interview with Michael Balint. Te American Journal of Psychoanalysis, ano 62, n. 4, p. 383-413, 2002. SOREANU, R. O estilo epistêmico de Michael Balint. 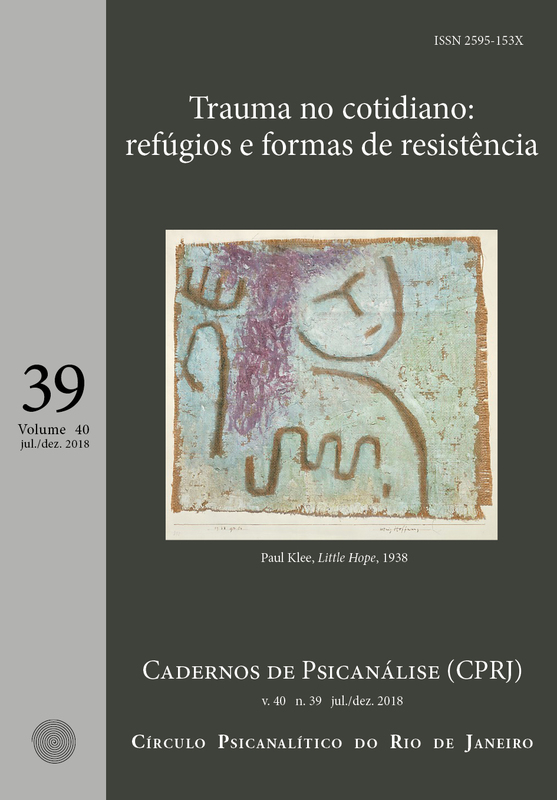 Cadernos de Psicanálise (CPRJ), v. 40, n. 39 jul/dez, p. 229-250, 28 nov. 2018.